Dog parks can be amazing outlets for high-energy dogs and provide much-needed opportunities for socialization, both of which are essential to dog well-being. However, not all dogs are ready for peer-to-peer fun, and not all dog owners are adept in dog park etiquette. So, let’s explore some of the more common misconceptions and how you can make your dog’s experience a positive one. As blue skies and warmer weather beckon us outdoors, a local dog park might seem like the perfect activity to enjoy. To maintain the safety and quality of experience for all, though, practice these precautions and manners. Keep your eyes on your dog (even when those pings are distracting) to avoid negative interactions and to gain insight into your dog’s social behaviors. Contrary to popular belief, dog parks are better served as places for socialization rather than the only source of exercise. A hyperactive dog is more likely to become a nuisance, so pre-exercise your pup a bit before heading to the park. While many dog parks offer water spigots, some do not. Especially during the warm summer months, carry plenty of extra water to keep your pet hydrated. Nobody looks forward to that squishy sensation of shoe on poo. Be a conscientious pet parent by bringing plenty of waste bags and properly disposing of your pet’s mess. You’ll make other pet parents happy too! 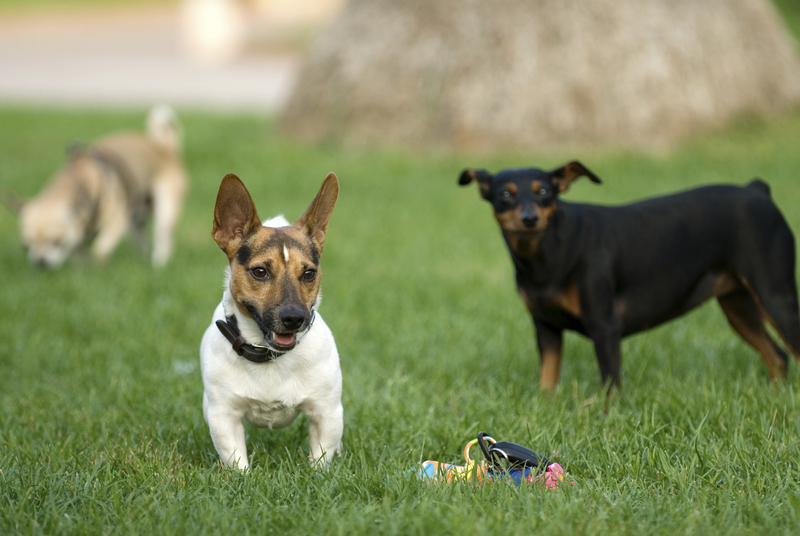 If you notice your dog taking too much of an interest in another dog, redirect him to a game of fetch – this is especially true if your dog starts to become the playground bully. Better to go home early. If your dog has never received any sort of obedience training or doesn’t know basic commands, focus first on instilling those skills and confidence before bringing her to the park (which can be overwhelming). Avoid heading to the dog park during the middle of the hot summer day – early mornings and evenings will help prevent heat-related illnesses and dehydration. Be mindful of other pet owners’ preferences about how their dogs interact with your own, and always ask when in doubt. If your dog is being intimidated by another dog or dogs, or doesn’t seem to enjoy the time at the park, keep his well-being and safety in mind and head home for the day. Please do not take an unaltered, sick, injured or unvaccinated dog to the park, for the safety of your pet as well as others. And, wait until your puppy is at least 6 months old, vaccinated, and trained before exposing her to an unpredictable mix of dogs and experiences. A trip to the dog park can be an incredible adventure or a nightmare, depending on a combination of dog behaviors and pet owner preparedness. To enhance your dog’s day out and be a stellar example of dog park responsibility, practice the above tips. If your dog needs help with behavioral challenges, phobias, or aggression, consider a behavioral consultation and assessment. Your attention to your pup’s health and readiness will make his experience at the park so much better when it is time to introduce the dog park adventure. Previous: Veterinary Technician Specialties: Do You Have What It Takes?